I talk to people every week that are right now preparing to start their first month in car hauling business. And as you know, there's a lot more to auto transport than getting a truck, trailer, insurance, and certification; plus plenty of opportunity to get some real world auto transport advice and solid car hauling tips. Thinking about starting your own car hauling business? This episode of Auto Transport Intel is for you. I'm also told how difficult it is to find reliable (and free) information about what it's really like to start car hauling. Many of you have contacted me because you need helpful and honest information about what really happens out there on the road. The funny thing is: I want to help you get the auto transport advice you're looking for. 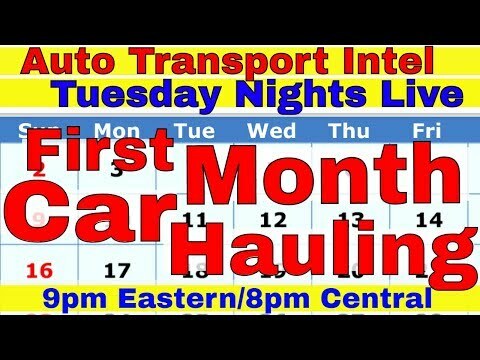 So this live show is me talking to new car hauling businesses in their first month car hauling so that we can discuss real world auto transport business. Kevin of Ryders Rydes in New York runs a private car dealership and also has a background in trucking. But only recently did he finally throw his hat into the ring of owning and operator his own car hauling business. In fact, he says its been two years of research before he finally started car hauling. He is now in his first month car hauling and is already learning a lot more than he planned. In fact one of his major gripes is about the ELD! Unfornutately, while the DOT is very concerned about the perfect safety of your new transport business, the constant requirement to be a perfect driver does not allow much room for new car hauler mistakes and the start up car hauling learning curve. So my interview with Kevin is about car hauling lessons learned and being an owner of a brand new car hauling business. Casey of Harrell's Hauling LLC is actually a co-driver of a new car hauling business and is also in his first month car hauling. And already, he and his co-driver are working hard to make this new auto transport business profitable and reputable. And not only does Casey focus on half of the driving, but he spends a great deal of his time booking cars and getting the most of dispatching. Of course, dispatching is my expertise so I was happy to offer my car hauling tips as a professional dispatcher. Even though his company is a new car hauling business in the eyes of many, Casey is adament about representing professional and timeliness in every car he hauls. When you listen to him talk during my interview with him, you know you're listening to someone that has taken good auto transport advice and is turning that information into his own solid car hauling business. And that's what Auto Transport Intel is all about. If by chance your company was mentioned in this live show and you don't like it, leave a comment, and feel free to take it up with that person directly. This is an open forum and opinions are news. And maybe your opinion will be the next news topic. Thank you Serge The Car Hauler https://www.youtube.com/use... and Hotshot Dave https://www.youtube.com/cha... and CHYKKO D'Transporter https://www.youtube.com/cha... for allowing me to use parts of your video in my intro. TO SUPPORT THIS CHANNEL, please do your Amazon shopping through my blog site: http://www.autotransportint... by clicking on any ad and then buy whatever it is you're really looking for. Thanks!